Antique Wind Out Tables are a Victorian design of dining table with a unique feature. As dining was such a big part of the Victorian home, a large dining table was essential to accommodate lots of guests, but this became a problem as it would take up too much room in the home, so Victorian cabinet makers came up with a brilliant idea. They would fit a mechanism under the table to enable it to extend and close to different lengths. This was done with a crank or wining handle, this was turned at one end and it twisted a spiral bar (called a corkscrew mechanism) that pulled the table open, enabling you to add additional leaves into the centre. This mechanism was mainly built by a company called Joseph Fitter from Birmingham who also built castors and other metal works specially for antique furniture. This design of table was so useful as you could have various lengths, you could have up to four additional leaves but they all did not have to be added at once. This meant you could open the table to the most appropriate size, dependent on how many dinner guests were coming. Have a look below at our lovely examples available for sale. Below are some examples of previously sold tables, let us know if any particular design is what you are looking for as we have new stock arriving daily. 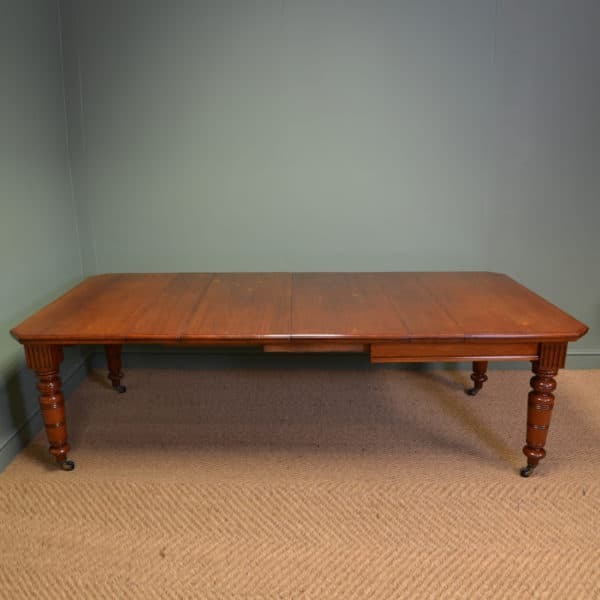 Quality Edwardian Walnut Large Antique Wind-Out Dining Table. 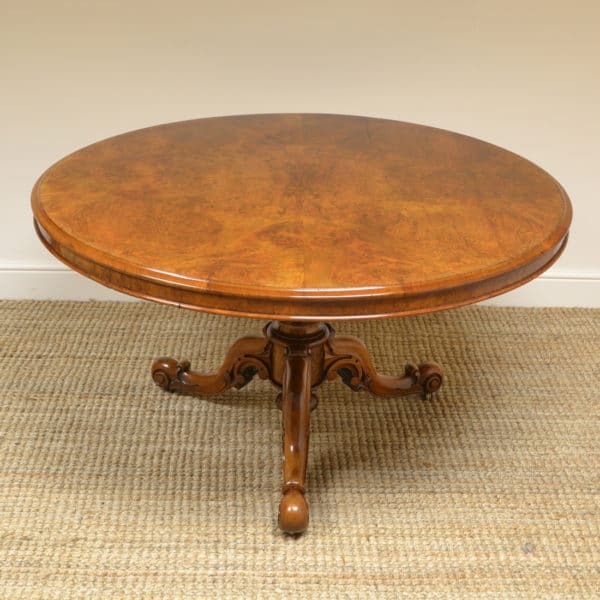 Dating from around 1900 this decorative Edwardian walnut large antique dining table comes complete with a Joseph Fitter wind-out mechanism and winding handle. The top has three central removable leaves providing the owner with a variety of options regarding the length of the table. The top is beautifully figured and has a decorative carved edge above a deep frieze. The four cabriole legs are also wonderfully carved and sit on ball and claw feet with brass castors. Rich, Warm Walnut, Antique Wind-Out Extending Dining Table. 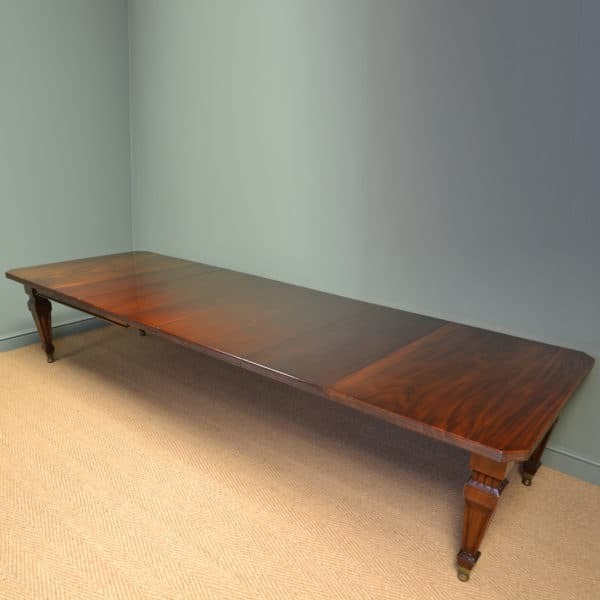 This antique Victorian wind-out extending dining table dates from around 1890 and is constructed from a rich warm coloured walnut. The beautifully figured top is made from solid walnut with two central removable leaves, has a winding handle and winding mechanism. The edges are moulded and the corners are canted. It stands on four delightfully turned reeded legs with brass cup castors with brown porcelain wheels. 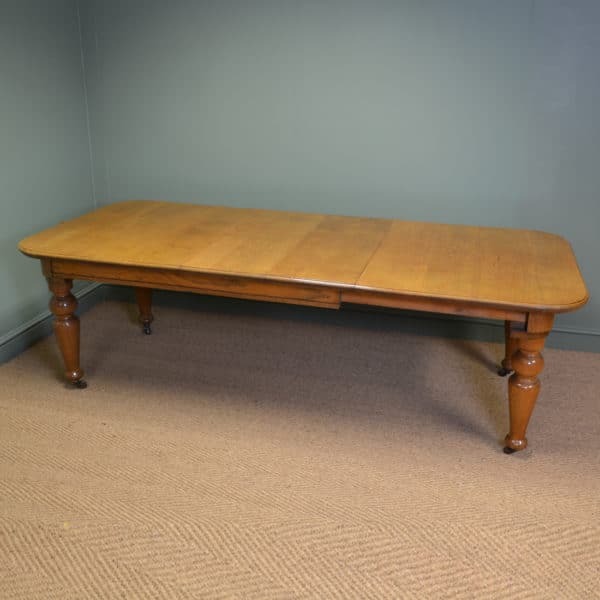 Golden Oak Victorian Antique Wind-Out Extending Dining Table. 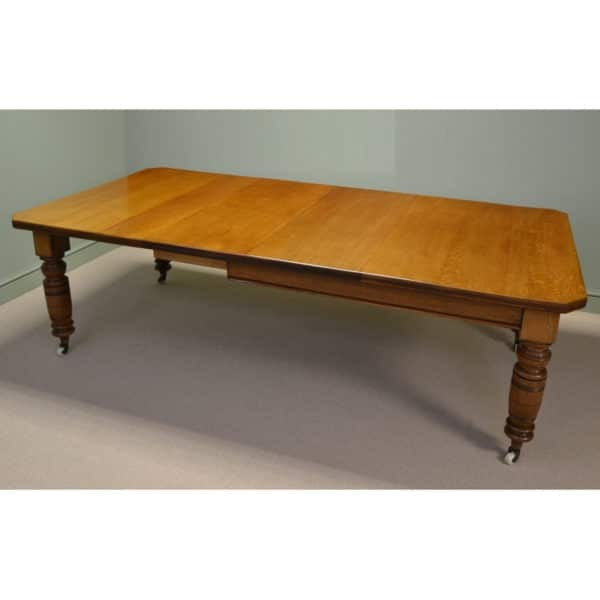 Dating from around 1890 in the late Victorian period this wonderful golden shade of oak dining table has the benefit of extending. The top is made of solid oak which is beautifully figured, has a central removable leaf along with moulded edges and canted corners. The table comes complete with a winding handle and wind-out mechanism. It stands on wonderfully turned legs which sit on brown porcelain castors. 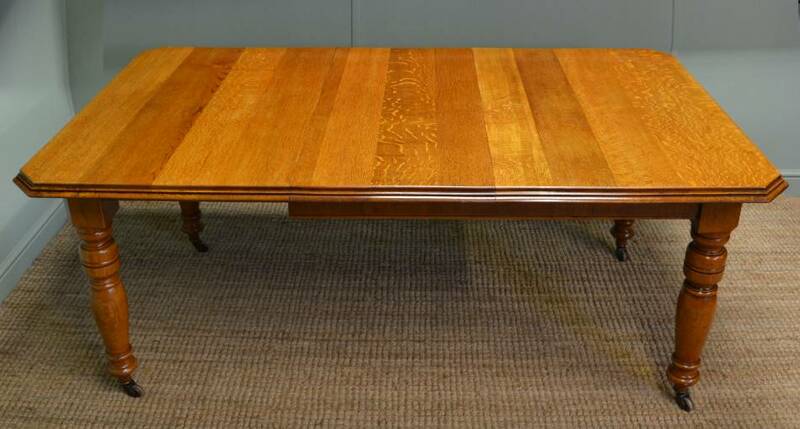 Grand enough for a dining room and robust enough for a kitchen, this table ticks all the boxes! Quality Antique Victorian Oak Wind Out Extending Dining Table. 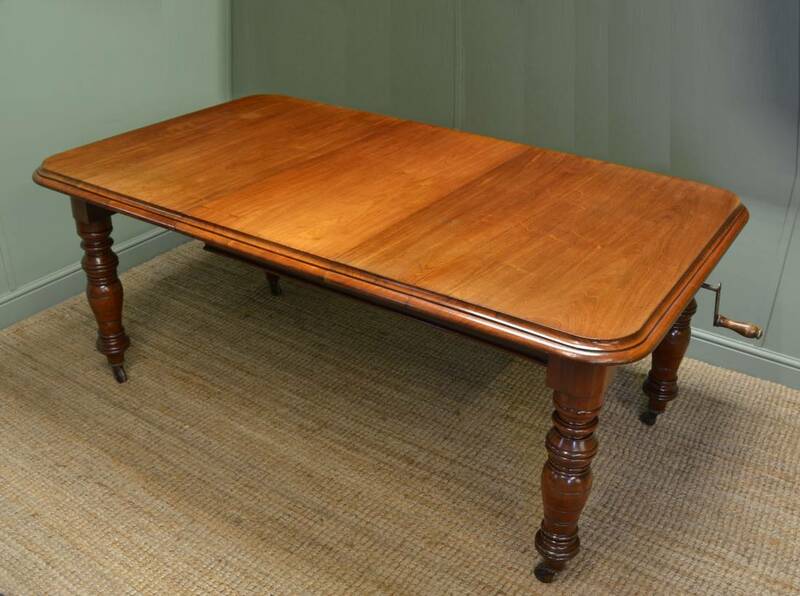 Dating from around 1890 this gorgeous Victorian oak antique dining table is pure quality. The top is made from solid oak and extends using a winding mechanism crafted by the renowned maker ‘Joseph Fitter’ and comes complete with a winding handle. The top has an additional two leaves and is beautifully figured both when closed or extended to its maximum potential. The moulded edge softens the look of the whole top and fits well with the four delightfully turned legs that are finished with brass castors. 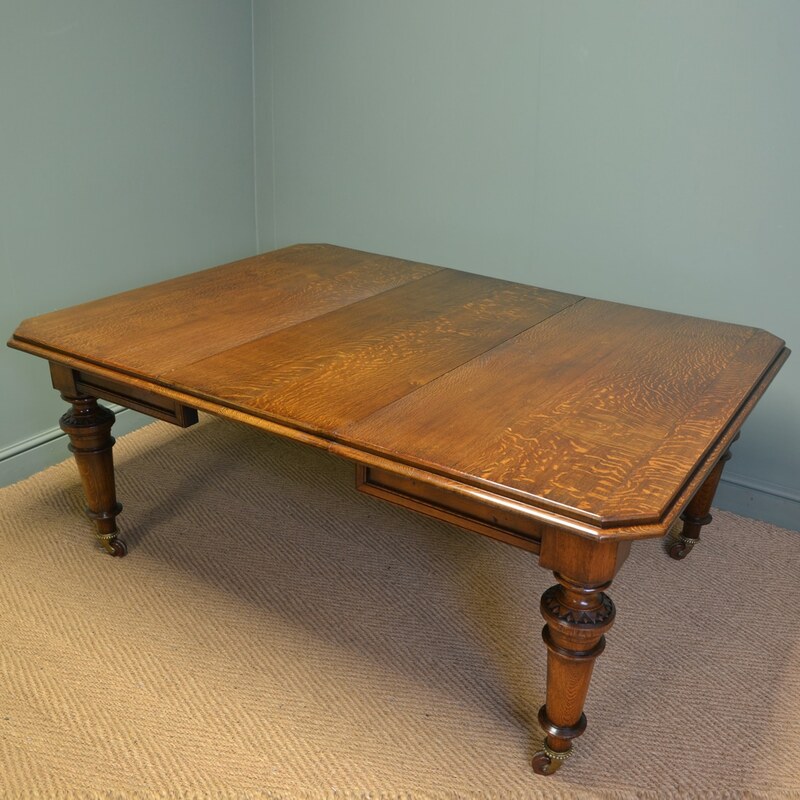 Overall a super example of Victorian craftsmanship in a very versatile table whose oak has aged to a wonderful rich golden tone with a striking grain, good patina, is in very good condition and has been beautifully cleaned using a traditional form of wax finishing. 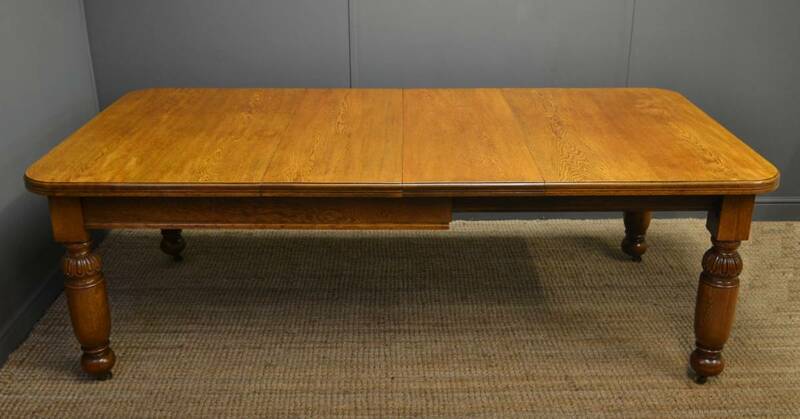 Edwardian Mellow Mahogany Antique Wind Out Dining Table. 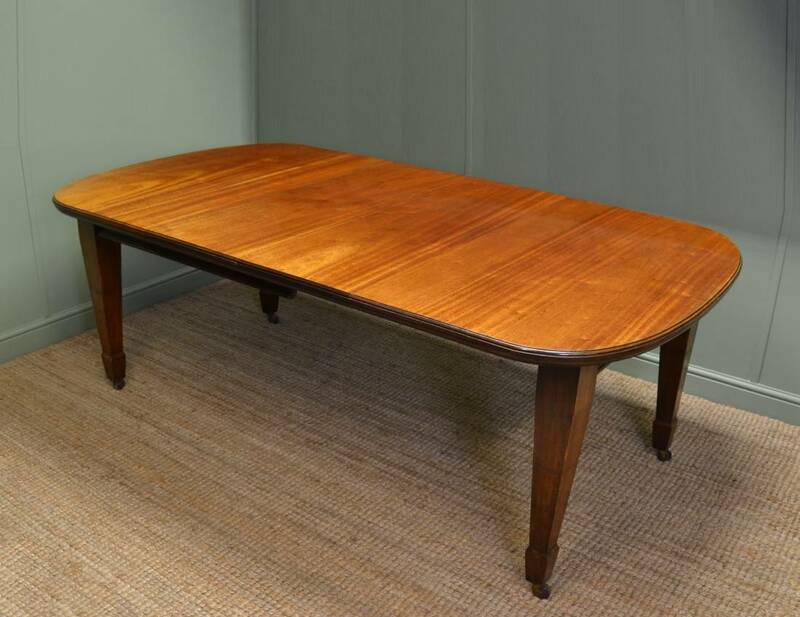 This stylish Edwardian antique wind out dining table is a lovely shade of mellow mahogany and dates from around 1900. It has a solid mahogany top with a moulded edge, rounded corners and comes complete with a winding handle, wind out mechanism and a single large central removable leaf. It stands on four tapering legs with spade feet finished with brown porcelain castors. 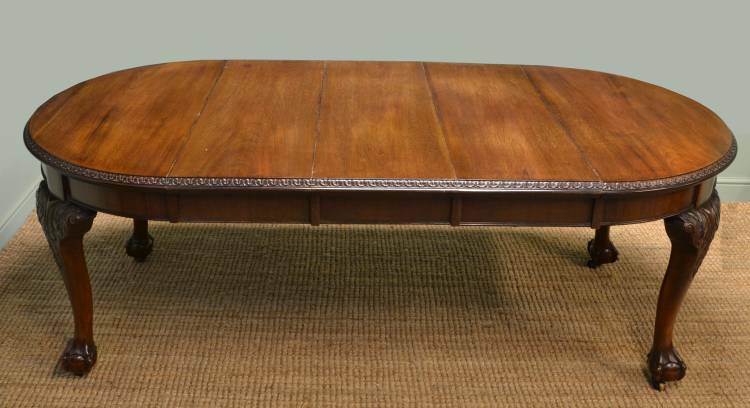 Dating from around 1910 this superb antique wind out dining table dates from the Edwardian period, is made from mahogany and still retains the original makers stamp of “Bartholomew & Fletcher”. 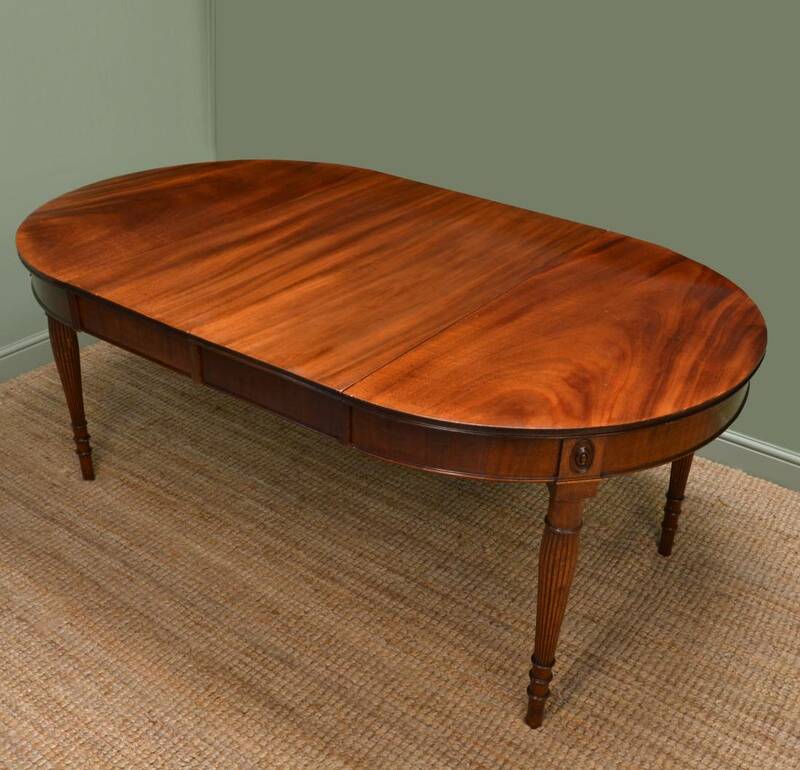 The solid mahogany top is beautifully figured and benefits from two additional leaves. The table extends using a winding mechanism operated by a winding handle (included). 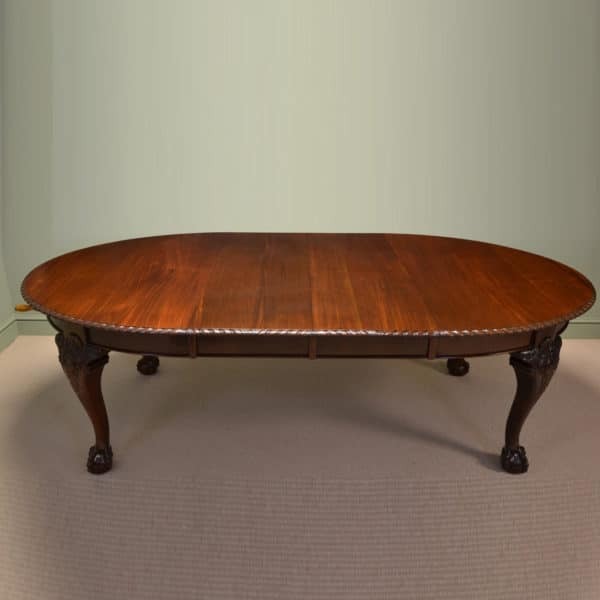 When closed it is a very attractive circular dining table with an unusual moulded edge above a deep apron and stands on four elegantly turned reeded legs with decorative carved motif to the hip. The additional leaves also include the deep apron so when the table is at its full length it is not obvious it is an extending variety, this is a true sign of quality and craftsmanship. 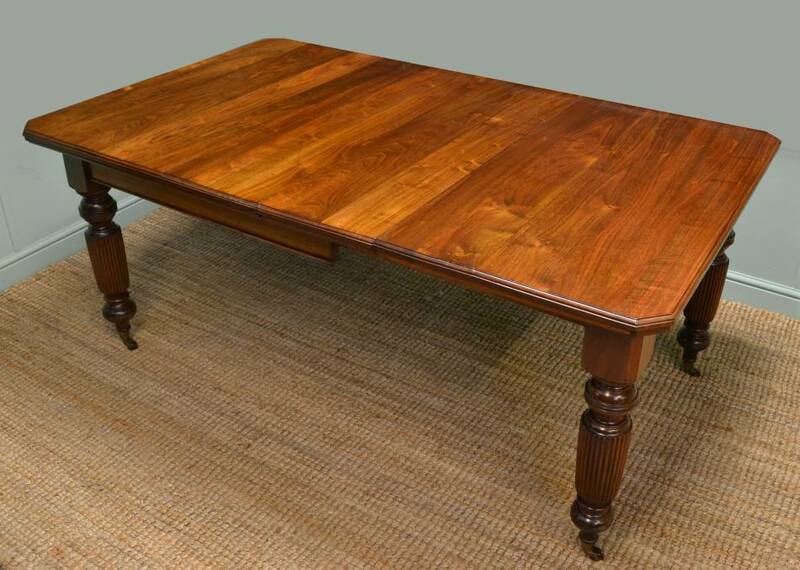 This Quality Victorian Solid Walnut Extending Wind Out Dining Table dates from ca. 1880 and comes with a wind out mechanism, winding handle and one central removable leaf, so is very versatile. The top is solid walnut and sits above four beautifully turned legs with brass and brown porcelain castors. 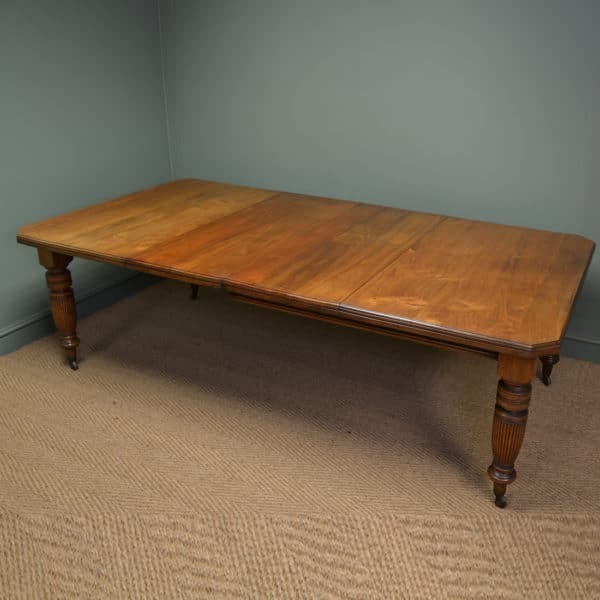 Dating from around 1870 in the Victorian period this antique wind-out dining table is made from walnut. It comes complete with two central removable leaves, winding mechanism and winding handle. The top itself is made from solid walnut and has a deep moulded edge with rounded corners. 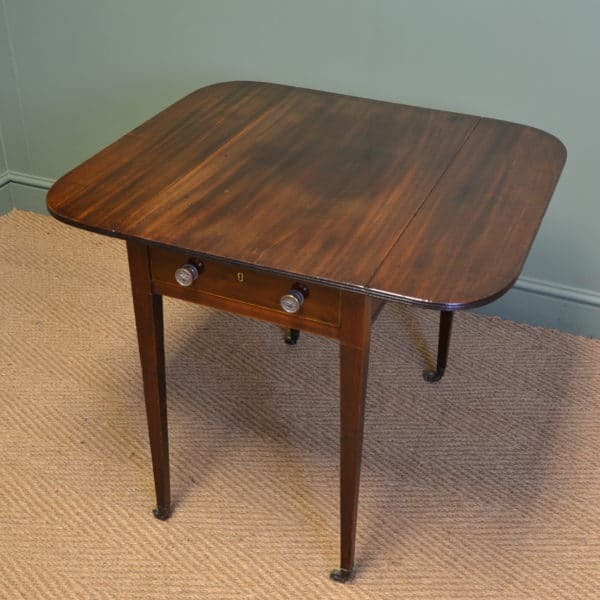 It stands on four beautifully turned legs which are finished with brown porcelain castors and has been recently re-polished bringing this delightful antique table back to life.